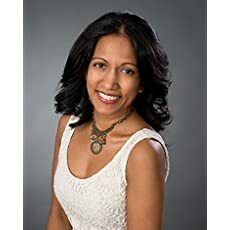 Tikiri is the author of the Red Heeled Rebels suspense novels and the Rebel Diva empowerment workbooks. When she's not writing, she's in her kitchen cooking up fusion cuisine with a glass of red wine in hand. She's also an adrenaline junkie who has rock climbed, bungee jumped, rode on the back of a motorcycle across Quebec, flown in an acrobatic airplane upside down, and parachuted solo. She has lived and worked on four continents and holds a Bachelor's degree from the University of Victoria and a Master's from the Solvay Business School in Brussels. After a lifetime of global travel and work, Tikiri is now a recovering nomad who calls Vancouver, Canada home. Tikiri's debut novel, Disowned, has been nominated for the Silver Falchion award in 2018. The Red-Heeled Rebels is a gripping adventure with an international twist. If you like gritty tales with nonstop globe-trotting action and complex twists that leave you at the edge of your seat, you’ll love these books! Want to go a wild international ride without having to get a passport or buy an airline ticket? This is the beginning of a suspense series that will immerse you in exotic locales, fascinating cultures, and mouthwatering food from around the world. 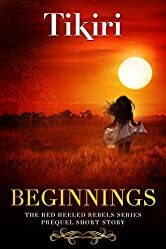 If you like gripping stories with non-stop globetrotting action and complex twists that leave you at the edge of your seat, you’ll love this series. Pick up this short story, to start the adventure today. What would you do if your own family hawks you to the highest bidder? Devastated after losing her parents to a fiery crash in East Africa, Asha has no idea what her future will hold. That is, until she’s shipped off to a seaside town in India to join an extended family she never knew existed. In a new country where forbidden customs prevail, she feels more alone than ever. She believes her new family will protect her, but doesn’t realize they’ve already decided her horrifying destiny. But Asha’s a fighter, determined to survive. Will she escape the men planning to enslave her? Will her fight for freedom endanger those she loves? This is a gritty tale of crime and betrayal that will take you on a mad race from the heart of Tanzania to a traditional village in India, and to the glass tower city of Toronto. 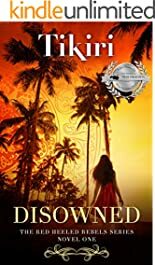 This Silver Falchion Award Finalist, Disowned is the first novel of The Red Heeled Rebels which feature gutsy heroines who travel the world and fight for freedom. If you like gripping, suspense stories with non-stop globetrotting action and complex twists that leave you at the edge of your seat, you’ll love these books. Pick up Disowned to go on an international adventure without even having to get a passport or buy an airline ticket. What would you do if your best friend vanishes without a trace? Asha and her best friend Katy arrive at London’s Heathrow Airport on their long trek to South Asia. A few hours later, Katy vanishes in broad daylight. Asha is frantic and dashes across the city to find her. She’s breaking the law and the border police are after her, but she has no choice. Ready to sacrifice her own life for her friend, she follows a mysterious robed woman to a place that holds dangerous secrets. Who lives in this house? Is Katy hidden in here, and will Asha find her alive? This is a gritty tale of crime and revenge that will take you on a mad race from the underbelly of London to the cobblestone squares of Brussels, and to the medieval land of citadels and castles in Luxembourg. Abducted is the second novel of The Red Heeled Rebels which feature gutsy heroines who travel the world to fight for freedom. If you like gripping, suspense stories with non-stop globetrotting action and complex twists that leave you at the edge of your seat, you’ll love these books. 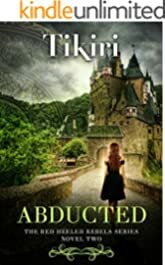 Pick up Abducted to go on a wild international adventure without even having to get a passport or buy an airline ticket.